The characteristics which have an influence on the performance of our racing pigeons are transmitted according to what is called: population genetics. 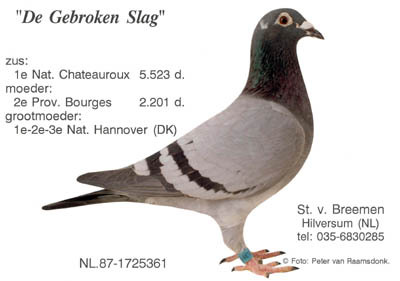 "De Gebroken Slag" is daughter of "De 151"(old inbred line of "De Oude Rosten" halfbrother of the worldfamous "Oude Klaren '46 of Desmet-Matthijs) and "Het Schoon Blauw". She, her brothers, sisters, halfbrothers and halfsisters all produced top ten National winners or National Ace pigeons! Who else can put such records on the table?? Watch therefore closely the guidelines for the breeding in this book! Characteristics which react in a positive way to cross-breeding. These are also the characteristics that may have a degenerative effect on a pigeon when a system of heavy inbreeding is used. These characteristics are: vitality, ability to get into racing form, ability to recuperate, resistance to disease, etc. These are the so called "additive" characteristics. In contrast with those in Group One, here selection is of the utmost importance. The result of cross-breeding, in itself, will not have an effect on these characteristics. Plus, inbreeding does not have a degenerative effect. Characteristics in this group are: intelligence, mordant/character, speed, and having a talent to race a certain distance. In Group Two, we find the most important characteristics. What is the conclusion of what has just been said?? Inbreeding has resulted in a concentration of characteristics from Group Two, within my own flock. This is possible because hundreds of genes are responsible for these characteristics: cross-breeding doesn't result in improvement, while inbreeding hardly shows any signs of a negative effect. The characteristics found in Group One are influenced by only a few genes, they are improved by cross-breeding while inbreeding has a definite degenerative effect. There is only one way to improve on the racing capacity of a flock: cross-breeding! Which ones of the inbred pigeons of our own loft do we use for cross-breeding?? As has been explained in previous articles, when pairing, we are dealing with a reductive division of chromosomes. An ordinary pigeon cell contains 40 pairs, or 80 chromosomes. Sperm and egg cells each only have 40 chromosomes, half of what an ordinary cell has. Also, only half of the hereditary characteristics of each producing parent bird are found in either the sperm or the egg cell. This cell division(reductive division) is done at will, as the outcome of a lottery. It is quite well possible that one sperm may contain 10 chromosomes of the father and 30 of the mother of the pigeon producing the sperm. If this happens, the off-spring will have more of it's grandmother's chromosomes, on the fat-hers side. Consequently, the off-spring will resemble the grandmother more than the grandfather. Another sperm coming from the same pigeon may have a ratio of 20-20, 13-27, etc. The forty pairs of chromosomes are split at random during the re-reductive division and become 40 single chromosomes which, when fertilized, are pined together with the 40 chromosomes from the partner, to form a new 40 pairs of chromosomes. Because every pigeon is born from a different sperm, and egg cell, it is not hard to understand why there can be so much difference between brothers and sisters. Sub conclusion: with inbreeding we are concentrating on a certain group of genes. As a result, with inbreeding it is more likely to breed pigeons with more of the genes of the "Klaren 46", than would be likely with cross-breeding. In every day language this concentrating on genes is often called a "degenerative effect". The result birds are finer in build, the developing of the bone structure takes longer, have less resistance and physical strength, and are hard to get in racing form. But from these pigeons we chose our breeders. When selecting breeders there are two important factors we should look for: the muscles have to be supple and flexible, while we want colorful eyes with small pupils. If their brothers and sisters have more vitality they can be used for racing. Which different ancestral pedigrees are we going to use for cross-breeding?? It is a well known fact that certain pedigrees cross well, and others don't. To increase our chance for success, it is very important to do a background study of different lofts, concentrating on the pedigree build-up, and the ability to transmit characteristics. Having done that we have 2 options. The first, is to cross-breed directly with a different pedigree. We may have a good chance of being successful this way since the origins of both pedigrees are genetically far apart. The second option is to increase the genetically distance even more by in-breeding both pedigrees before cross-breeding. It is harder to use the first option, because if you want to be successful you have to buy a super racer, and not everybody is in a position to do that. Instead, use the second option and get some who directly are bred off a super racer; securing from mother and son, or nephew and niece. They may be easier to get, and you increase your chances of success because the genes have been concentrated. How do I do this?? For cross-breeding I've chosen a few pedigrees which in the past, several times have proven to combine well with Desmet-Matthijs pigeons. From these pigeons I've selected a pigeon who's one certain characteristics can improve my flock. On purpose, I made sure that the pedigrees I chose had talents in racing several distances. In this way I may be able to develop in my lines the ability to race with success any distance from 100 to 500 miles. From my own flock I select a pigeon which I've obtained by using the schedule of inbreeding I described in a previous article. I cross her with a bird from another pedigree, if possible, also inbred. The offspring are used in the races. After a few years I'll select the best flyers from these crossbreeds and pair them back to pigeons from my old line. In this way it is possible to add a new characteristic(such as speed) to my own family. This breeding back into the family is also inbreeding and the offspring here are suitable again for breeding. After this, we can start all over with another different pedigree. When, in this manner, we have integrated several pedigrees into our own family, we have improved our birds in several areas. It is possible to plan ahead for years to come, to know exactly when to inbreed, cross, or add something new. It is really all quite easy. All we have to do is reapply the basic concept of the breeding schedule we presented in an earlier article. Remember "Het Boerke" from the pedigree. In my loft he was crossed with "De 150 Duif", a Janssen hen, bred half brother x half sister on a fantastic basic breeding hen "De 08 Duif". The successful youngsters of this crossbred combination were later on brought back successfully into the own family. It was even so that the successful combination with both families was repeated over and over again and each time with great success. Lately, I read often about how fanciers try to categorize everything under the heading "good". And as long as you pair "good" with "good" you're on the road to success. I wish it was that easy. Isn't it quite common that a super racer, even though he's being bred to partners better and better in standing, never manages to come up with something that is able to fly across the road?? While there are other cracks who are able to produce good offspring. "Good" with "good" doesn't always work. We can only apply that rule when we have properly evaluated the capacities of our best birds. Important characteristics which should be passed on are: mordant, intelligence and speed. Vitality, resistance and the ability to get into racing form are other characteristics which are necessary for a bird to perform well. Professor Anker divided them into two groups. I have illustrated them extensively, still they can be sub-divided or others can be added to them which are also important. For your convenience I've tabled them(see Table Four below). 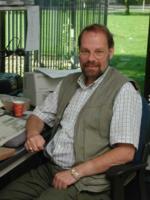 Prof. Anker proved that his thesis is correct by experimenting with it on racing pigeons, pigs, sheep and horses. But how do we apply his theories to our daily life as a racing pigeon fancier?? First we should make a study of the most important characteristics and become familiar with them. Don't let yourself be side-tracked by some "Know-it-all" fanciers. In the following articles I will deal extensively with all the characteristics, one by one. Using this method I have bred numerous exclusive racing pigeons. The most famous is probably NL77-990312 who, for three years in a row, could be counted among the best four National Ace Pigeons Short Distance of Holland and was in 1980 1st National Ace Overall. Prof. Anker proved his theories in his own land. It worked for me in Holland as well. I wish you the best of success with your studies, studies which you can't do without in pigeon sport.